New feature: When a chart is selected, its ribbon tab now offers dropdown elements for fills and lines. New feature: If your mouse can scroll horizontally with its wheel, SoftMaker Office now supports it. With Windows 10 (build 1803), the program title bar was no longer correctly displayed in ribbon mode. In certain situations, a wrong file was used for the user dictionary, resulting in words added to the spell checker still being flagged as unknown. If you send a password-protected file by e-mail, the password is now retained. The keyboard option in the “Customize user interface” dialog box now distinguishes between Ctrl+5 above the main keys and on the numeric keypad. You can now customize the key used to open the Hamburger menu in ribbon mode. The dropdown elements in the ribbon now work with the Arabic user interface. When a dropdown list is open, switching to full-screen mode no longer causes a crash. Windows Transparency is now handled correctly with 3D AutoShapes. New feature: More than one object can now be pasted from the clipboard to the body text in editing mode. New feature: You can now customize the keyboard mapping for TextMaker’s database window. New feature: You can now abort dragging a tab or indent marker in the ruler with Esc or Alt+Tab. Spell checking with Duden Korrektor is now faster. Improvements to the file filters for RTF, DOC and OpenDocument Text. Speed improvements to RTF import. Inserting a field could cause a crash. REF and PAGEREF fields import improved from .doc files. The table-row option “Keep with next row” is now saved to .tmdx format. Arabic text in tables is now correctly saved to .tmdx and .docx format. If you drag a template with an attached database onto the TextMaker window, the address book now opens. New feature: You can now abort dragging a worksheet tab with Esc or Alt+Tab. When used with empty arguments, the INDEX function now behaves like in Excel. Improvements to opening .xls files with pivot tables. Pasting RTF text from TextMaker no longer modifies the cell styles in PlanMaker. Pivot tables can now be created from tables even if the first row of each column is empty. Long text in cells no longer causes overlapping. With “Always show comments”, inserting a row above a comment could cause strange display of such comment. The ribbon tab “Object” is no longer shown for tables. Trying to delete a header/footer placeholder only deleted its content, but not the placeholder itself. Applying a layout to all slides could cause a crash. When a .prdx file is already opened by one user, another user can now open it on read-only mode. Keyboard shortcuts did not work in the variable and output window. 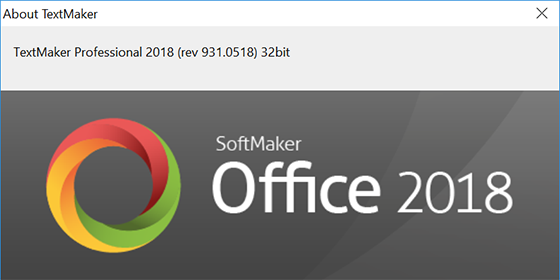 By default, SoftMaker Office 2018 for Windows keeps itself up-to-date by automatically downloading service packs. If you have not installed the automatic update tool or simply want to know if your version of SoftMaker Office is current, you can also check for updates manually. Start one of its applications, click on the “?” icon in the ribbon and choose the command Check for updates. If you are running SoftMaker Office in classic mode with menus, choose the command Help > Check for updates.